Technology | T&D Center | NAKATA MFG. CO., LTD. The central division that created FFX mill and develops the next Nakata-only technology. Our mission is "invention and development for better forming technology," and we have worked hard to achieve our goal. At our technology center we developed 3-dimensional plastic/elastic FEM analysis technology and applied it to create FFX Mill backed by theoretical and scientific analysis. As the leader of the industry, we set our goal to develop ERW pipe machines that meet today's tough requirements. We pursue new forming technology for the future as well as upgrading existing technologies. Computer aids (CAx) connect T&D center and design division accurately and fast. 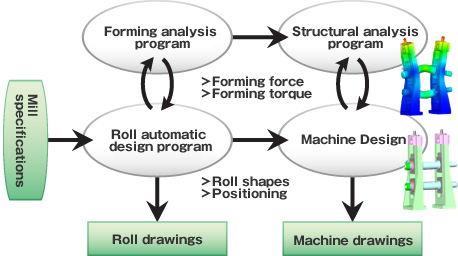 At our T&D center we custom design rolls and their positioning into a parameter profile using forming analysis programs based on customer's requests. In addition, the design department finalizes the machine design considering the roll design received from the T&D center and apply structural analysis programs. The computer aids (CAx) make us possible to incorporate NAKATA's technologies in ERW pipe manufacturing lines we deliver.